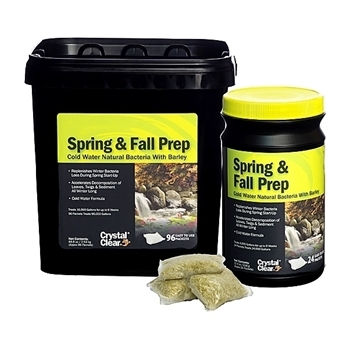 CrystalClear Spring & Fall Prep contains cold water natural bacteria and barley designed to accelerate the break down of leaves, muck and other organic sediment during the fall and winter months while replenishing inter bacteria loss in the spring. Packaged in easy-to-use water soluble bags to keep your pond looking its best even with water temperatures below 60 degrees. If a problem arises between routine applications Spring & Fall Prep should be applied every 3 days until desired result is achieved.